When Clarence Wijewardena, Chanaka Perera, Vijith Peiris and Dixon Gunaratne formed the Golden Chimes in 1970, Lankika Peiris was just a friend of the outfit. She joined Golden Chimes in 1971 on being invited by its leader Clarence Wijewardena. She had been a friend of Golden Chimes' members on account of her relationship with its member Chanaka Perera whom she had been engaged with at that time. Chanaka was on bass and vocals of the Moonstones led by Annesley Malawana until he broke away from Moonstones in late 1969. Clarence Wijewardena was on rhythm and vocals of the Moonstones. When the Moonstones was first introduced in 1967, the members were using only acoustic guitars. After the break up of the Moonstones, Chanaka and Clarence had often met in Colombo where they discussed the possibility of forming a new band. Chanaka was involved in organizing a musical show in Moratuwa at that time. Chanaka made his intentions clear to Clarence and Vijith (drums). The idea was to perform at the show as a band. Vijith and Clarence were excited about the idea and they paired up for the task. The boys named themselves as "Break-aways from the Moonstones" and performed at the show. Anton Gunatilleke, who used to play with Chanaka with the Beacons, played the lead guitar at the show. Anton was a guest performer and was there temporarily. So Clarence brought in Dixon Gunaratna to play with the new band, the Golden Chimes. Lankika Perera, the only female vocalist of the Golden Chimes thus revealed the beginning of the Golden Chimes in an interview with In Tune. 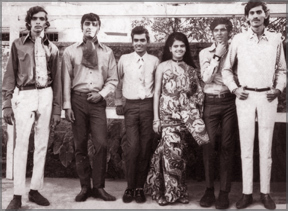 The original Golden Chimes in 1971 : Anil Bharathi, Clarence Wijewardena, Chanaka Peiris, Lankika Perera, Vijith Peiris and Dixon Gunaratne. She has performed with Golden Chimes for over three decades and is currently celebrating her 35th year in the field of music with the Golden Chimes. The Methodist Wesley Guild of Rawathawatta has organised a concert, titled "Celebration 35" at the Methodist College Auditorium, Kollupitiya on September 9 at 7 pm, to commemorate the artiste's land mark 35 years as singer. I met Lankika Perera last Wednesday at her office on the 21st floor of the Bank of Ceylon building, Colombo. Perhaps Lankika is the only female vocalist who has ever performed in a band for more than 30 years. Among her songs are evergreen classics such as Kimada Nawe, Molaketi Puthuni, Lalai Welai, Sandai Tharui, Bethlehempure, Puthu Nidiyai, Sihina Sagarei and Hiru Negila. The Golden Chimes is undoubtedly the Sri Lanka's foremost band that has delivered the most number of original Sinhala songs with a touch of its own musical colour that is rooted in Western music. Their music has a lasting quality that could be described as the characteristic Golden Chimes' tonality which is present in almost every song they have recorded in the 70s and 80s. Lankika said, "it was Clarence that introduced this particular style of music to the band. He is an unbelievably talented musician." How did Clarence joined the Golden Chimes from the Moonstones? Chanaka, my husband, was the first to leave Moonstones. Clarence left Moonstones after him. How did "Break-aways of Moonstones" became the Golden Chimes? The name, Golden Chimes was given by Gerald Wickramasooriya, the chairman of "Suriya" label record company. Most singles were released those days under the reputed Suriya Label. The founder members of Golden Chimes, late Clarence Wijewardena, Chanaka Perera, Vijith Peiris (Lankika's brother), and Dixon Gunaratne, released their debut EP in 1971 under Suriya Label. Clarence composed the lyrics and musical arrangements for Kimada Nawe, Mage Palpathe, Sihin Sinawai, and Samanalayo. Lankika was taking a stroll down memory lane of her musical past. "It was at this point that Clarence invited me to join the band as their female vocalist," she said. A second album was also recorded with singles Surangana Wes Wala, Sihil Nuwan, Mage Wiyowen, Malai Mellow, which was launched under the Phillips label. Then Chanaka invited his cousin Anil Bharathi to perform western songs in the band. What happened just after forming the band? After forming the band Clarence stayed at our place in Moratuwa because of his friendship with my brother Vijith. At the time Chanaka was visiting our place. When Clarence asked me to join the Golden Chimes, my parents agreed but they said I had to marry Chanaka, who was seeing me at the time. Chanaka and I got married in December 1971. Clarence composed "Ran Seenu Handavi" for our church wedding which was sung by many artistes there. When was the Golden Chimes was at its peak? During the period of 71 and 72. The band toured all over Sri Lanka. During 1972, our songs were heard over the radio in both English and Sinhala channels including Vijaya Corea's show. Our third EP was produced during this year. How do you describe your singing ability and your repertoire as a singer after decades of singing? It's a gift from God. The talent I have is a gift from above. Lankika has released about 50 original songs so far. All popular to this day. I am happy that Golden Chimes' songs are loved by every one. I recently met a young boy from Gampaha, who is 14, who happened to be a big time fan of me and the Golden Chimes. His name is Rukshan Karunanayaka. He has done a song for us, composing lyrics and music. He is presently practising with the band with his guitar to perform at the concert. The funds generated at the concert will be given to Rawathawatta Methodist Church Reconstruction Fund. The Bank of Ceylon, Etihad Crystal Cargo and SpeedMark Transportation Pvt Ltd., are the main sponsors. A CD titled "Golden Chimes Then and Now" will be launched at the show. Annesley Malewana, Indrani Perera, Anil Bharathi, Mariazelle Gunatilleke, Christine Gunewardena, Rajiv Sebastian, Keerthi Pasquel, Sureshni Wanigasuriya and Rukshan Perera will perform.